The Whittard of Chelsea chain of shops has been sold to a private equity firm after going into administration. Administrators Ernst & Young said the company, sold for an undisclosed sum to EPIC private equity partners, "had been experiencing trading difficulties". "The business will continue to operate as a going concern, and all stores will remain open," Ernst & Young said. The deal secures, for now, the jobs of 950 employees who work in its stores, which sell tea, coffee and crockery. The company had been actively seeking a buyer. Whittard has 130 stores in the UK and was founded by Walter Whittard in 1886. It also operates a wholesale business called Boaters which sells flavoured coffee products. It was bought by the Icelandic investment company Baugur in 2005 for about £21m. Baugur itself was hit by turmoil in Iceland's economy earlier this year. Richard Spiegelberg, a spokesman for the purchasers, said that the private equity firm had acted on behalf of a group of UK institutional investors. He also said it was "too early to say" what the ultimate shape of the group might be either in terms of employment or the number of shops. It has been a tough year for retailers amid the global economic downturn. High Street legend Woolworths went into administration last month, and all its 800 stores will be closed by 5 January with 30,000 job losses. Furniture retailer MFI also went into administration in November, and had to cease trading last week with the loss of 1,400 jobs after the business failed to sell. Whittard expanded rapidly in the 1980s and 1990s both in the UK and abroad, including stores in Dubai, Abu Dhabi, Kuwait, Singapore, South Africa, Chile and the US. But its troubles had begun even before this year, according to the company's most recent published accounts. 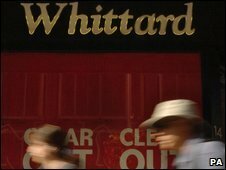 For the year to the end of March 2007, Whittard reported a £3.2m loss due to fierce competition.